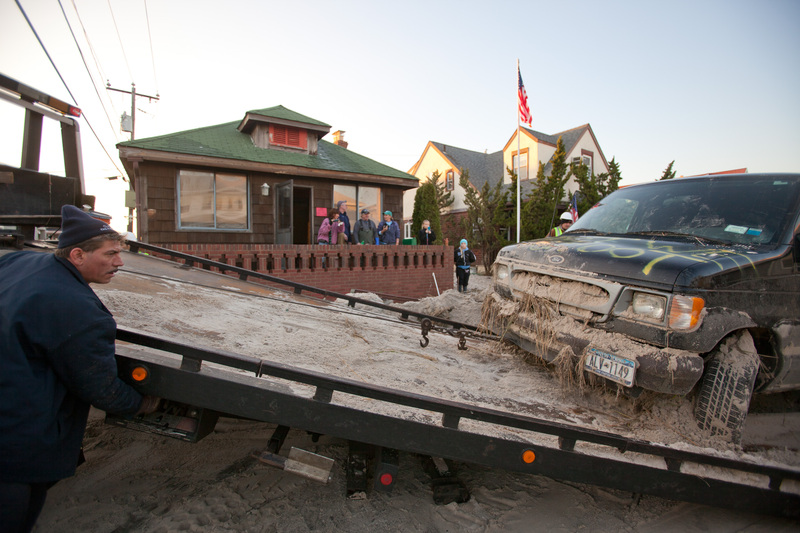 Tomorrow marks the one-year anniversary of one of the worst coastal storms in U.S. history. Hurricane Sandy made landfall just north of Atlantic City and left billions of dollars in damages in its wake. A year later, impacted areas of New Jersey and New York are continuing efforts to recover from the pounding the storm delivered. The one-year anniversary of Hurricane Sandy serves as a reminder of the devastation the storm brought to neighborhoods along the Atlantic Coast. The NRC focused on the safety of nuclear power plants in the storm’s path as Sandy bore down on the region, dispatching additional inspectors to augment the resident inspectors at some of the potentially affected sites to provide for 24-hour coverage. In addition, the agency shifted to an elevated response mode that involved the activation of the Incident Response Centers in our Region I and II offices, and the Operations Center at our Headquarters office. Throughout the event, the NRC also worked closely with state, county and federal partners, including FEMA. As the storm struck, the plant closest to the eye of the hurricane, Oyster Creek in New Jersey, was shut down at the time but nonetheless had to cope with flooding conditions at its water intake structure and a temporary loss of off-site power. Three other reactors, meanwhile, either shut down or were knocked out of service by the storm’s effects. At no time was the safety of these plants or others in the Northeast compromised, reflecting the high level of training for their operators, the hardened nature of the structures at the sites and preparations leading up to the storm’s arrival. Still, there are always lessons to be learned from such events. For many nuclear power plants, the storm has led to a fresh evaluation of severe weather guidelines. These guidelines cover such areas as when a plant needs to begin powering down when wind speeds associated with a severe storm begin to impact a facility. As for the NRC, we continue to assess the ability of plants to withstand severe flooding as part of our post-Fukushima reviews. Each plant is required to complete a flooding hazard re-evaluation to confirm the appropriateness of the hazards assumed for the site and the ability to protect against them. Plant owners are required to use updated methods and information, with the results determining whether any additional regulatory actions are needed. More information on the NRC’s post-Fukushima reviews is available on the agency’s website. Thus far, 2013 has seen low levels of hurricane activity, but Sandy will stand as a powerful reminder of the need for vigilance when it comes to storm preparations. Let’s Chat – What Are Your Thoughts? The NRC launched a pilot of a new social media platform – Let’s Chat – in April. It’s somewhat similar to this blog, but it features a real-time discussion on a specific issue with an NRC expert responding to the questions. Our next session is today from 2 to 3 p.m. Eastern with Len Wert, from our Region II office in Atlanta. He will speak about his experiences during the many hurricanes he’s dealt with, as well as how nuclear power plants are built to withstand a whole host of severe weather events. Now we’d like some feedback from you. Have you been to a Chat? What did you think? Are the times and days of the week convenient? We also like to hear your topic suggestions. We do have some limitations on topics for the Chat. It’s not the place for regulatory issues currently before the Commission or likely to come to the Commission, for example, or actively being adjudicated. But if you suggest a topic and we can make it work, we’ll put it on the schedule. Author ModeratorPosted on June 6, 2013 Categories GeneralTags hurricane preparedness, NRC, social media36 Comments on Let’s Chat – What Are Your Thoughts?